The Lytro light-field camera has a lot going for it. There's the compact, modern design, not to mention the super-cool feature of letting you focus AFTER taking a shot. And yet, somehow, the $400-500 camera hasn't exactly exploded into the mainstream consciousness yet. That has us somewhat baffled, though we have a sneaking suspicion it might have to do with the price. Half a grand is lot to drop on a device that can't even share your pics. Well, that's yesterday's news. The company just released a software update that now unleashes the teeny camera's Wi-Fi connectivity. Huh? This thing has a Wi-Fi module? It sure does. The FCC came across it when it evaluated the product last year, but the company wasn't ready to do anything with it yet. But this new firmware now pulls the trigger on it, just in time to take advantage of Lytro's brand-new iOS app. The mobile app finally delivers some very long-missed features, including sharing and a larger working area for refocusing an image. (That Lytro touchscreen is tiny!) And thanks to the spiffy new Wi-Fi, the images can go from camera to mobile device to upload without a single computer cable being plugged in. The photo transfer to your iOS device happens automatically (within roughly 5 to 6 seconds), which is extremely handy for on-the-spot editing or sharing, and the app can also display shared images from other Lytro users. For now, the company only offers the iOS app. There is no Android, Mac or PC app, although an Android version is in the works. Strangely, the company hasn't made a peep about desktop apps. Then again, Lytro seems to like surprises, so there you go. If you have a Lytro and want to check out the new update, here's what you need to know: The firmware essentially turns the camera into a Wi-Fi hotspot that your iPhone can join. To begin, you hook up the camera to your computer and let the new software load. Meanwhile, you can download the iOS app to your mobile device. Once both devices are ready, pick up the Lytro and swipe up to access the taskbar on screen. There should be a new Wi-Fi icon. Tap that and your camera is now a hotspot. 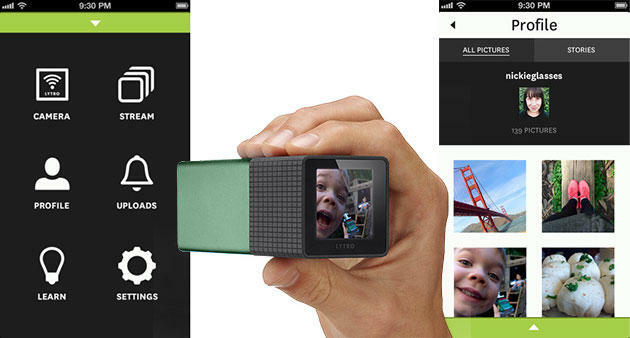 Set your iOS device to join its network, launch the Lytro app and now the devices can communicate wirelessly. Interested? You can pick up the Lytro mobile iOS app here. To find out more about the Lytro camera, visit the website here.